Undertake a whole of farm system analysis of the incorporation of fodder beets into the feedbase. These objectives have been achieved by completing two field experiments and undertaking a series of whole farm system modelling scenarios. The field experiments investigated the impact of sowing method (precision vs. conventional drill) and sowing rate (40 000, 80 000, and 120 000 seeds/ha) on crop growth, development and forage quality. The measured yields, yield scenarios and the associated cost of production) were then used for the farm system modelling. A summary of the results from the field experiment and the farm systems modelling is given in tables 1.1 and 1.2. During the project, results were extended through a number of mechanisms. A project outline was placed on the TIAR dairy centre project website (www.tasdairyprojects.com.au) and farmers and service providers visited the Irishtown experiment as part of the 2011 DairySmart forage crop field days (Plate 1). Several enquiries for information from farmers and agronomists resulted from these activities. An article presenting the results of the project has been prepared for the October 2011 edition of Tassie Dairy News and a research note has been developed (see appendix 1) which will be placed on the TIAR dairy centre project website. Section 2 of this report in which the field experiments are described will be submitted as a research paper to an international peer reviewed science Journal. 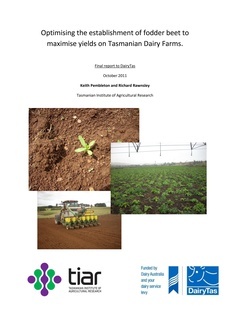 The findings of this project have also been communicated to the seed company that supplied the fodder beet seed so they can refine their agronomic package to suit the Tasmanian environment. From this project it has been concluded that fodder beets intended for direct grazing in Tasmania do not need to be sown with a precision drill to achieve maximum yields. However, fodder beets cannot adequately compensate for low plant densities through increases in individual plant size. Consequently, ensuring the optimum number of plants established is critical for attaining maximum yields. In Tasmania, the optimum number of plants established for fodder beet crops is between 6 and 8 plants/m2. To achieve such plant densities may require sowing up 120 000 seeds/ha depending on the soil type and level of seedbed preparation. The costs of production of the fodder beet crops ranged between $1,600 to $1,800/ha. Farm systems modelling identified that when fodder beets are grown on the milking platform, and as such, removing perennial pasture from the milking platform, the required yield for making this a profitable decision at the whole farm system is 23t DM/ha. This is 3.7 t DM/ha higher than the maximum yield attained in the field experiments. If fodder beets are to become a viable forage crop option within the Tasmanian dairy feed base, further refinement of agronomic practices (particularly in the area of weed control) will be required to increase yields.